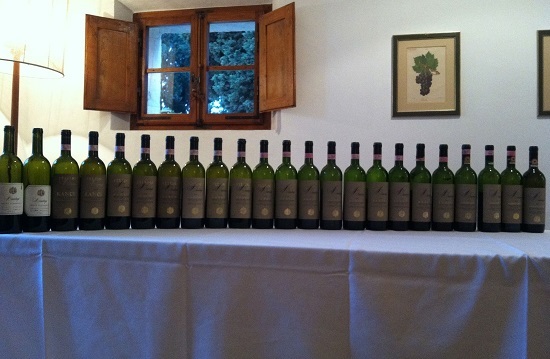 I will never forget this once in a lifetime tasting of Felsina’s flagship Chianti Classico Riserva Rancia. What started out as a casual survey of a few older vintages turned into a complete vertical as proprietor Giuseppe Mazzocolin and long-time oenologist Franco Bernabei surprised me with bottle after bottle of fabulous Rancias going back to the inaugural 1983. A few days after this tasting I received a complete lab analysis of all the wines, one of the most valuable pieces data I have ever seen, and a presentation worthy of serious wine scholarship. The single biggest takeaway from this tasting is the amazing consistency of the wines across all vintages. Considering its modest price, Rancia remains one the most fairly priced, cellar worthy wines in the world. As great as Rancia can be, the straight Riserva makes a fine substitute at about half the price. I learned that lesson recently at Maialino in New York City, where Wine Director Liz Nicholson served me a fabulous bottle of the 1995. I have to say there is something about the wines of the 1980s and mid 1990s that go straight to the heart. Giuseppe Mazzocolin describes his early wines from the 1980s as the huge challenges to make because he constantly had to convince his vineyard workers to drop fruit, something that was a culture shock and that seemed like an enormous waste of money given the mindset of the time. If present-day vintages develop only half as well readers will be in for a treat as those wines mature. Readers will notice that the early wines from the 1980s were called Vigneto Rancia, rather than simply Rancia, which became the norm beginning in 1990. The wine has been made from the same parcel since the first year.